One very popular singing game was the kind with a call-and-response format. That way, the greatest number of people could participate, even if they weren't familiar with the lyrics. Here, an entire family took part in the fun. In this audio clip, you can hear the McDonald family sing "Dog Flea." "Dog Flea" is a ring game song in which kids hold hands and circle around one person in the middle. That person tries to break out of the circle on the line "dog flea is a bitin' me," and the group responds, "don't keer caint git outa here." When someone finally does break out of the circle, everyone chases him or her until that person is caught. CREDIT: Rothstein, Arthur, photographer. 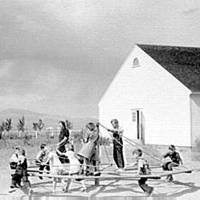 "Children of Resettlement Families Playing in the Schoolyard, Community Building, San Luis Valley Farms, Alamosa, Colorado." October 1939. America from the Great Depression to World War II: Photographs from the FSA and OWI, ca. 1935-1945, Library of Congress. AUDIO CREDIT: McDonald Family. "Dog Flea." May 27, 1939. Southern Mosaic: The John and Ruby Lomax 1939 Southern States Recording Trip, Library of Congress.